I bought a 4x6 band saw from Harbor Freight a couple years ago, and was immediately disappointed with it as blades jumped off, cuts were far from vertical, some hardware parts were missing, etc. After reading a lot including the 4x6 Yahoo group messages, I finally got it under reasonable control by increasing the tension on the blade and shimming out both guides nearly 1/8". Still, it's never been very satisfactory and the blade stops cutting vertically at random times. I finally got a hold of the 4x6 bandsaw tune up sheet which has circulated, and yesterday had time to go through the entire procedure. 1.) I first checked that the lower wheel had no axial play on the driveshaft. It didn't. Good! 2.) I then checked with the straightedge that the two wheels were in the same plane after adjusting the upper wheel to vertical. They weren't. The top wheel was 1/4" inside the lower wheel. I therefore removed the top wheel and was able to fit it on the bench vice with the inner bearing face resting on the jaws. and the shaft free. A few taps with a hammer and brass drift moved the shaft in the required distance. The press fit wasn't super tight, and it really was just a few taps to shift it. 3.) Re-mounting the top wheel I then checked that the wheel was parallel in the horizontal plane with the lower wheel by checking at both edges of the rims with the straightedge. This was problematic because the upper rim has so much slop. The stamped metal slides are a very loose fit -- apparently intentionally. I therefore took the average by checking play to either side. The top wheel was far from parallel in the horizontal plane with the lower wheel. So I added a 1/16 shim to the leftmost slide. This brought the wheel average of play to parallel the lower wheel. 4.) I removed the blade guides. I then added a little tilt via the blade tracking adjustment screw and mounted a new 10-14 TPI bi-metal blade and, with the motor belt disconnected, turned the pulley by hand for one full blade revolution. The blade stayed on, so I reconnected the motor, and turned it on. The new blade was adjusted to just contact the upper wheel rim without riding heavily on it. 5.) I turned the motor off and reconnected the blade guides and loosened all of the roller bearings for adjustment. Here was the first real problem. The instructions said that the inner guides are fixed and to adjust the outer guides to allow .005-.010" clearance. But the inner guides on my saw were adjustable. On a vertical wood cutting bandsaw, I would normally just bring the guide in to close contact with the blade. But on these horizontal metal cutting band saws, the guides intentionally twist the blade out of the plane of the wheels. So they must be brought in to apply pressure. And a single guide roller will not fully twist the blade. It requires the opposite roller to pinch the blade in and give it the full required twist. Therefore it is difficult to determine where this all should be located. The blade without guides is no longer a reference for guide location. I finally decided to bring the inner guides in as far as they could go -- reasoning that they would act like a 3rd wheel on the band that way, pushing slightly outward, rather than the opposite. Then the inner roller was adjusted to give .007 clearance -- but where measured? The blade actually rides at an angle to both guide rollers because of the twist. I measured it at the front. Another problem, seems to me, is that because the rollers aren't tight to the blade (to prevent swarf from jamming it) the actual blade twist is less than if it were tight, and proportional to the clearance provided. So how do we get the blade perpendicular to the saw clamp for a vertical cut? Any time the clearance changes, the saw will not cut vertically. Another problem showed up -- after adding the guides, the blade no longer tracked well on the lower wheel. It rode out about 1/8", though seeming to ride well on the upper wheel. I therefore shimmed the lower guide support back. This helped reduce but did not eliminate the override. But was left as acceptable. 6.) The only way to adjust the saw to cut vertically considering the variable pinch angle of the rollers is to take some test cuts and shim up the blade guide supports to eliminate it. So, per the written instructions, I used a piece of wood 2x2 to do test cuts while adjusting shims under the guide supports, taped on with duct tape (ugh). When I had it looking good in wood, I switched to a metal bar to do the final cuts. A few slight shim adjustments and I had a perfect vertical cut. Phew! The new bi-metal blade does a nice clean job, and the vertical cut is a pleasure to work with. I hope it stays. I'm attaching the adjustment instructions I found and used, in case this is of use to others. Thanks for that, mine is fine at the moment, but thats a very comprehensive list to sort out any future problem. 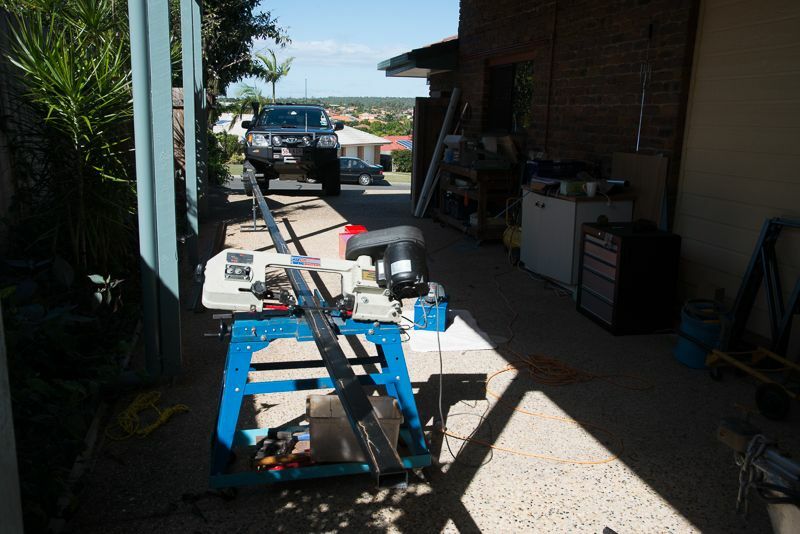 Well thought out attack on a fairly common problems with horizontal bandsaws. Armed with this information the job of tuning a band saw to get the best performance is a much less onerous task. Thanks for posting that guide. After I finish working on my lathe, I plan to tackle the 4x6. I want to add some kind of chip collection and coolant a well. All is not right yet, unfortunately. This morning I went to cut two pieces of 1/2" x 1" steel bar and the blade jumped off the wheels twice. I readjusted the top wheel to give it more camber, and was able to saw my pieces. However, when the sawhead was horizontal and cutting, I could see that the top backing roller wasn't contacting the upper part of the blade. So I tried to readjust the upper and lower backing rollers and couldn't get them both to contact at the same time -- there wasn't enough adjustment available. Okay, got it sorted out today after another hour on it. Mine needed the lower blade guide arm moved back (in the direction of the back of the blade). To do this I shimmed the frame even more than it had been already. To move it back evenly, I shimmed the rails on both sides where the arm slides. After additional shimming, I was finally able to make a square cut and that was repeatable. I now also had both backing rollers in contact and working. The blade rides where it should on the lower wheel now. And I have made many cuts since moving the guide back, and the blade has not jumped off again. To further test the saw, I cut out 7 blocks of steel to make some new tool posts (inspired by the 48 tool posts made by Daveo J). So the tune up method works, but my saw requires a LOT of shimming even after truing the wheels. The reason was simply that the arms and roller guides are really not located properly in relation to the trued up wheels. I'd like to do a better job of it than what I have now -- I don't like duct taped stacks of shims recommended in the tune up guide. 1.) 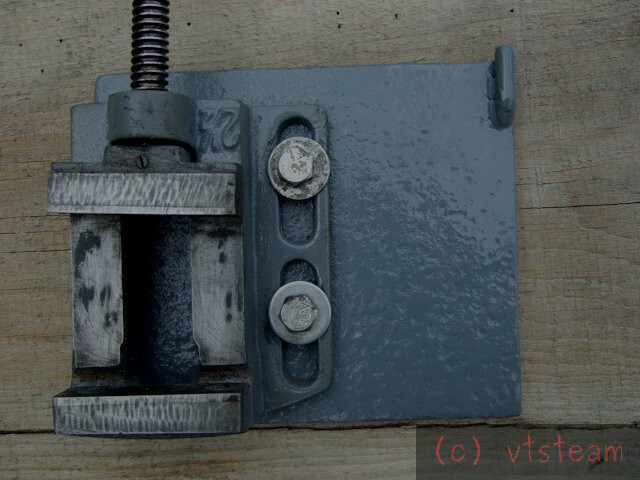 If the lower wheel could be moved out, that would reduce the number of shims needed under the lower guide support arm. I don't know if this is possible, but will check at some point. I don't want to readjust everything again for awhile -- I want to use the saw for projects now. 2.) I was thinking that instead of shims, perhaps I could drill and tap 4 holes into the main casting where the support arms slide, and install long grub screws there. Two on each side. By backing these out of their holes they would act as adjustable shims. I could do this now without having to re-true the wheels. So probably will. 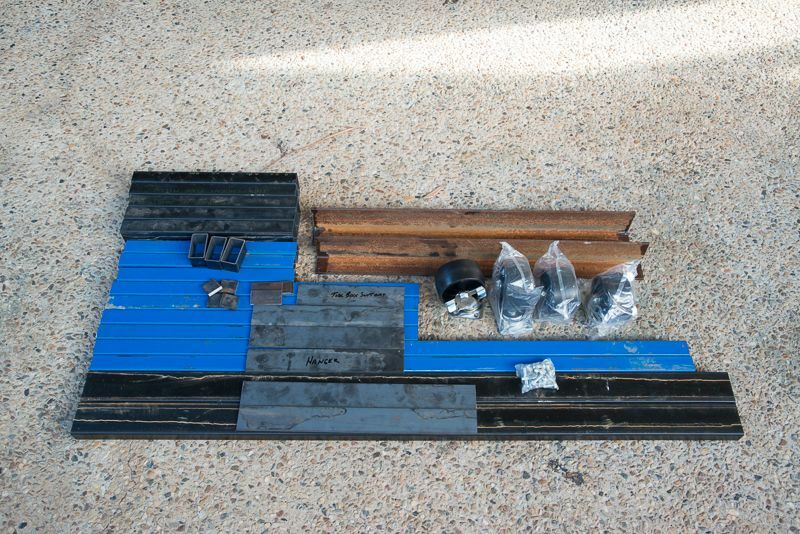 I've come to realize that the amount of shimming needed depends on the gap I set between the pinch rollers and the dimensions of the saw blade itself. Because the pinch rollers twist the blade, the closer they are set to each other, the greater the twist, and vice versa. And twist affects the squareness of cut. Anyway, hope this info also helps others. I did the shimming on mine back some time ago. Also worked on getting the blade to stay on. Didn't know there were actually instructions out there. One of the best additions I made was to make a .25" plate table to use the saw in vertical mode. Made it as large as possible and still be able to drop down completely. 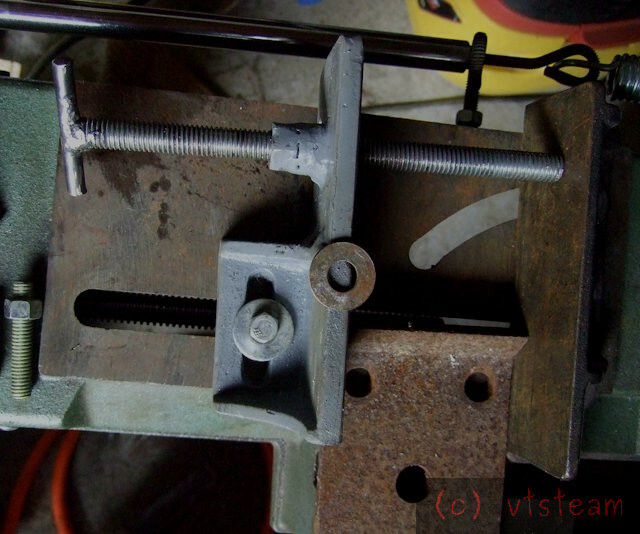 Also used an old cheap vice mounted vertically and held by the built in vise on the saw. 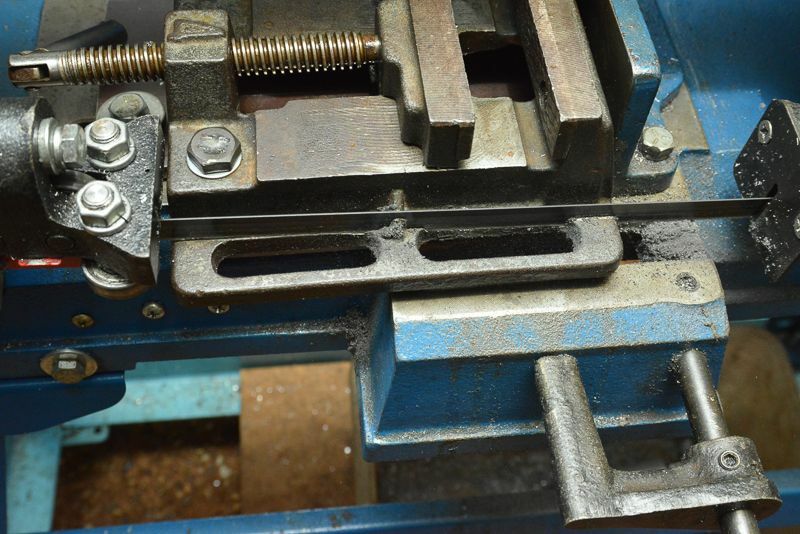 It allows me to cut off very short pieces that could not be held by the built in vise. Thanks for posting your observations and the instructions. One of the things I have noted about the cheap Chinese 4X6 horizontal/vertical bandsaws is that none of the surfaces are either flat or true when it comes out of the box. About one-third of the units brought to me for salvation have serious problems with drive and idle wheel alignment. About one in ten has seriously eccentric bearings. And about two-thirds have the pivot for the saw-drop located out of true with the table. I have reached the point where I dress the "table" in the base as without even bothering to check it out. I then index to the "table" and rebore the holes for the "pivot axle," install bushings, and line drill & ream them. The "pivot fence" (used in the horizontal orientation) gets replaced with one made from dressed L2X2X3/8 angle. The "pivot" itself gets swapped out to a ø.625 shoulder screw (stripper bolt) that allows me to drill & tap to a .3125-18UNC hole that will be known to be true & square to the table. 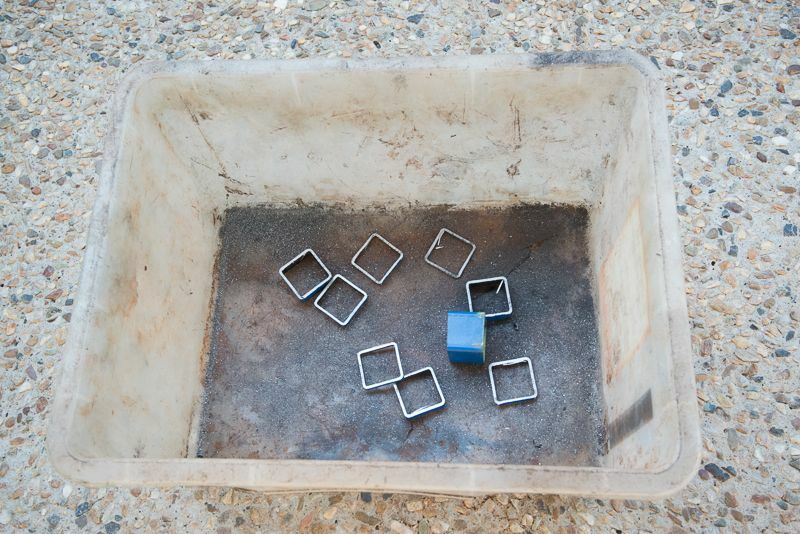 A custom acetal (Delrin) washer gets made to assure that the fence pivot mates properly. I then mount a block to the (driven wheel side) lower guide arm such that I can measure the sweep as the bandsaw head pivots from the vertical to horizontal positions. I rebore & bush the pivot axle holder to make that square to the table. Then I start looking at the alignment of the wheels and guide bearings. Properly set, I have sawn 4X6 blocks of merchant steel and ended up with faces that were flat & true within .004 FIM. I have sliced pieces as thin as .035 from such blocks and had the thickness be consistent +/-.006 (though +/-.012 is more common). The comments about good quality blades is essential! I have been a Starrett and Lenox blade snob for several decades. I have added the higher-end blades sold by Grizzly to my acceptable list. Poor quality blades = poor quality results. A .500 X .025 (inch) blade can typically be tensioned to 800 lbs of tension. That is a torque of 35 lb-in (3.95 N-m) on the blade tensioning screw. Thanks for the details of your fixes, and for the attachment. I had this annoying blade jumping of the wheels, have done quite a lot of mods now to improve the machine, but have never seen this detailed check and remedy you have shown. I must go over my machine and make some checks. Be sure to check the wheels for roundness. I have an older all cast iron model made by Rong Fu Both wheels were lobed enough that the bumps could be felt easily by touching the surface of the turning wheel with a fingertip. I took a light cut across the rim of each wheel, just enough to clean them up. That cured the problem of the blade jumping off for me. Glad you got this sorted. I went though this process a while ago and shimmed the sliding guides on the outside of the top wheel out with a few washers rather than to disassemble stuff and move the bottom shaft out. The missing piece which I picked up elsewhere is to move the blade once it is tracking and place a 12" metal ruler between each pair of guide wheels and tighten the rollers up so they hold the ruler. Then it is really simple to true the blade with a set square horizontally and vertically. This is so much easier than trying to true the blade with test cuts. Ah, this gives a reference for the initial setting when both inside and outside rollers are the adjustable type. Definitely the missing piece. Thanks so much !!! 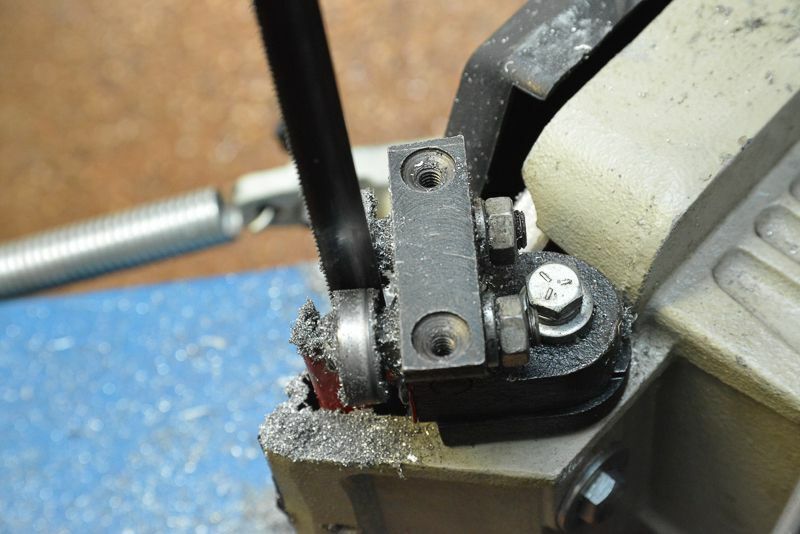 I bolted a small vice to a 6" x 6" x 3/8" piece of plate -- that can be clamped into the main bandsaw clamp to hold small pieces close to the blade. 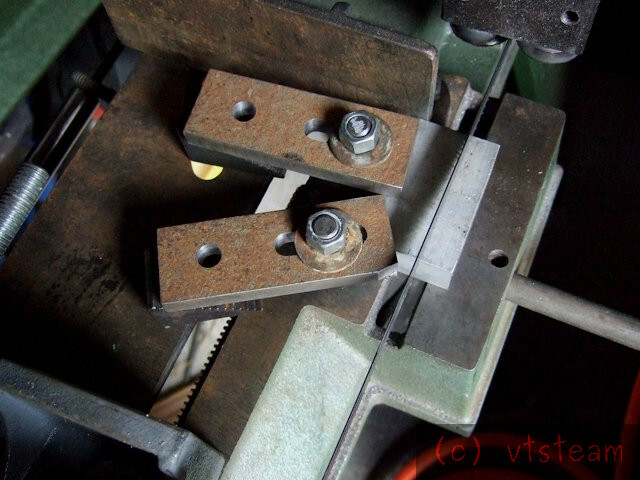 I drilled two 5/16" holes in the bandsaw base plate and tapped them 3/8-16 to take studs and miller clamps -- again to hold small pieces near the blade. I welded a 3" long piece of 3/8" steel plate to the edge of the cast iron movable swiveling bandsaw clamp to extend it as wide as the fixed clamp. I used 7018 stick, back welded in 1/2" sections, peening the weld until cool to the touch for each weld section before continuing to the next. This worked and the cast did not crack and the weld is solid. Always wanted to try that method. Usually i braze cast iron and insulate it in wood ashes afterwards to let it cool slowly. But the short back weld method worked without preheat and insulated cool-down afterwards. Very impressed. Made the mistake of trying to trim the rough piece in the bandsaw afterwards -- the blade cut fine until it hit the weld metal. But that was probably the equivalent of chilled iron and dulled the teeth on an expensive bi-metal blade. Oh well, should have known better and ground the weld out where the blade would cross. In fact I did, afterwards, and the damaged blade cut verrrrrrryyyyyy sloowwwwwly through the remainder of the softer steel. Well, got it done. Tomorrow I will add a screw spacer to the far side of the new extension. 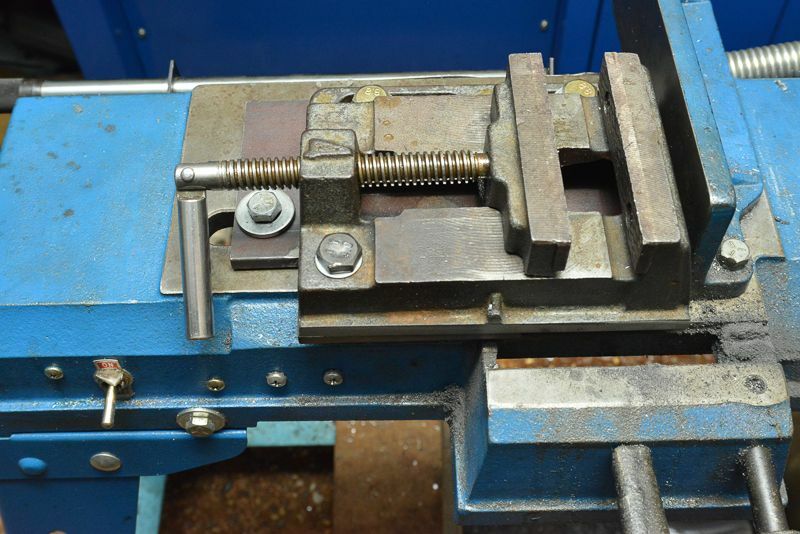 No more trying to find stock the same width as a short piece when clamping in the main vise. So now I have 3 separate aids to clamping short or irregular pieces. While looking at your saw, it might be worth considering a new table. I was getting some stuff laser cut and for an extra $10.00, I got two of these plates made out of 5mm plate from a DXF file I did up. Some saws have the slot in the table facing towards the back but this table works on it as well. Which after the holes were countersunk looked like this. The critical dimension is the distance between the bolt holes. 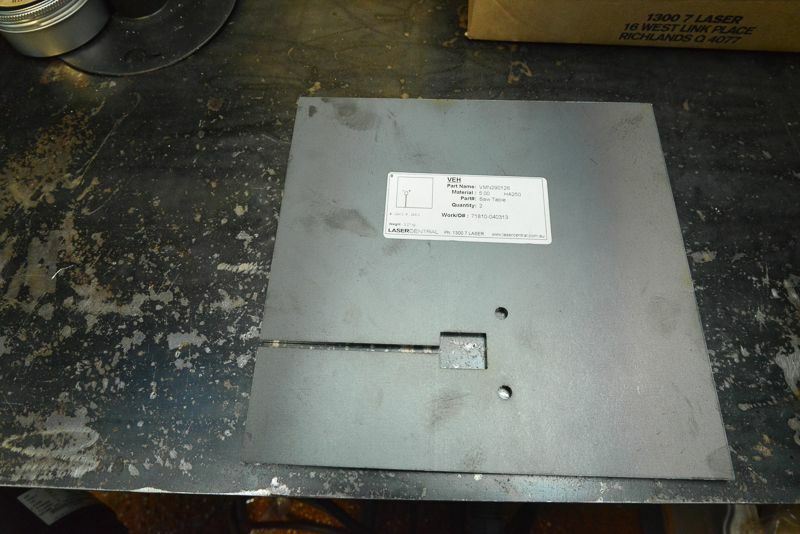 I've since seen a variation to this where the plate was attached to another block of metal and stayed on the saw and hinged up out of the way when in horizontal mode. I don't use the saw vertically that often so won't worry about it. Also, probably not as flexible as some other methods to deal with cutting short pieces of stock. I donated a drill vice to my saw. Some do have other solutions which allow the angle to be adjusted but this works well for me. I've since massaged it a bit and got the vice closer to the blade and trimmed a bit more off. 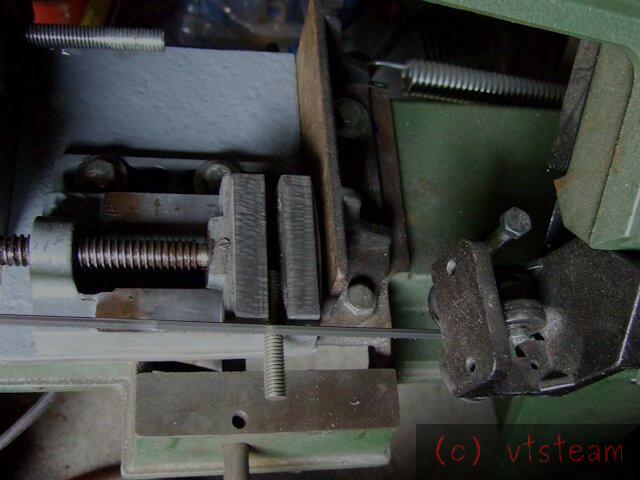 It is just a matter of removing the swivel jaw and putting the vice on in its place and it is squared against the back gauge. Anyway, I can hold about 10mm with it now. The other thing I have found that makes it cut crooked is too much downforce on the blade. Here's the first mod -- I welded an extension onto the moveable jaw. Then I welded a short bit of 1/2" pipe to a 1/2" nut, and then welded that onto the extension. A piece of 1/2" all-thread serves as a depth adjustable blocking screw. The pipe section allows it to retract all the way without having to be removed. This is how this works to clamp an irregular short piece. This is the second mod. Quite similar to RodW's except I used a narrower vise which allows me to use the separate plate attachment method without having to remove the moveable jaw. It just clamps in place. This and the previous one are common mods of these saws. But one difference I added to mine is the welded positioning pin in the upper right of the photo. I found that the clamp plate tended to lift if the piece being cut was tall -- effectively creating a long lever being puled by the bandsaw blade. At one point the whole plate came loose and jumped up. No good. So I added the pin -- it fits into a hole in the new extension of the moveable jaw, and effectively locks everything in place. 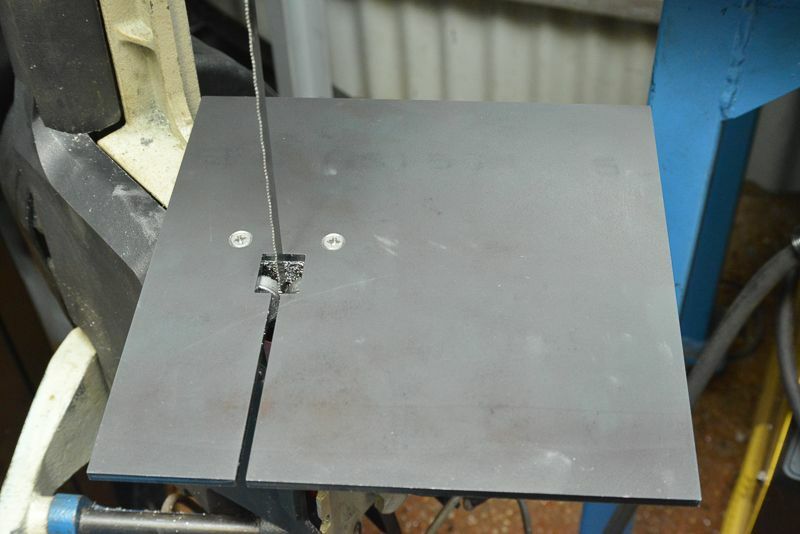 The vise plate can no longer lift out of the bandsaws clamp. And here is the final mod -- a couple of holes in the base to fit studs for using milling clamps -- they were drilled and tapped 3/8-16. I like this a lot, and think I will add some more holes further away from the blade to give a lot of clamping positions. Who needs anything else when you have done this mod? Great Idea! I might add that my vice was too big to fit in the vice jaws and it was looking for a purpose in life. Sounds like my mounting method fixed a problem I did not know about (the back edge lifting). I thought I'd give a bit of an update on this topic. Just when I thought I had my bandsaw cutting accurately, I found it was way off when I wanted to cut down steel for my lathe stand. 1. If the blade is not perfectly perpendicular to the work, it will wander off course. 2. Observe the blade from directly above while cutting. If it seems to be wandering from side to side, add more weight to the cut. This might be caused by a slight kink in the blade but I did not investigate. 3. Holding a steel ruler in the guides to set the blade is a good idea. It gets you close but not close enough. Make sure you check both ends for squareness. 6. Realign the back guide to the blade with a set square after adjusting the guide angle as it will affect the angle. Then I could get on with the job. I was surprised how long it took to cut this down but it was worth it in the end to have square cuts. Still need to weld this up. 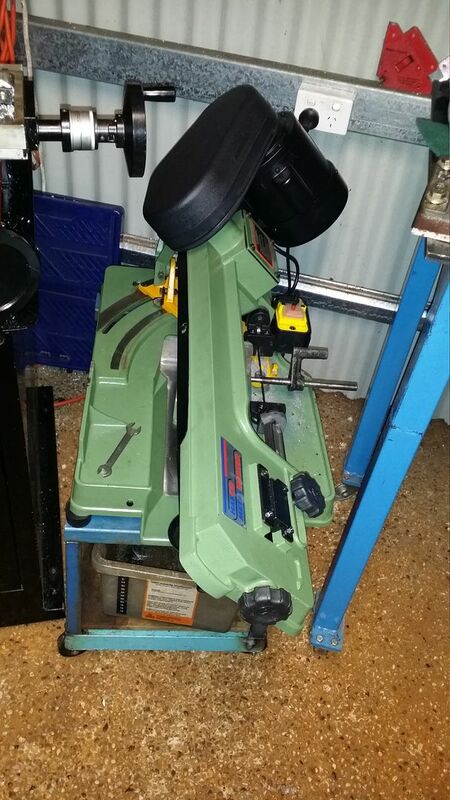 I'm having a trouble with my trusty old (something like 18years) cheap bandsaw. It has been maintained and not much modified. It used to cut very square. 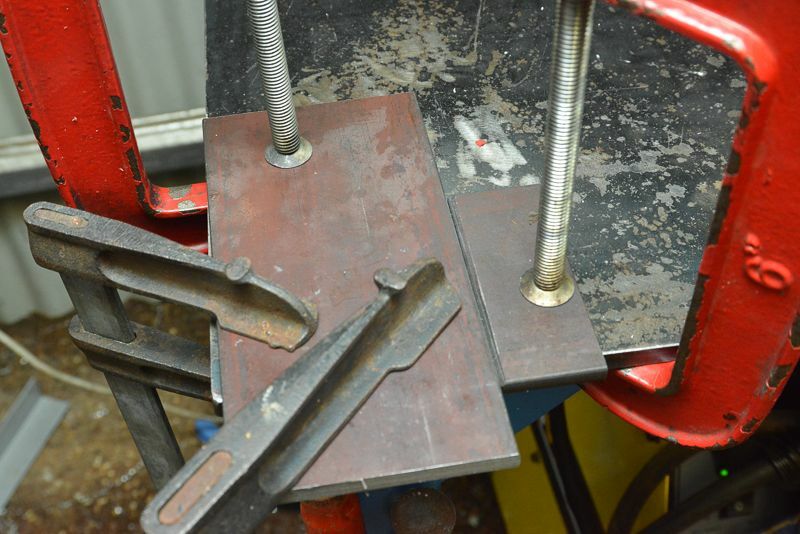 Last weekend I noticed that it is cutting 2-3 mm skew on 30*80 mm hot rolled slab. Ok, I though that I had too small pitch blade and I changed I changed more coarse blade. Same results. I wiggled the saw, it was pretty solid, the pivot axle has been refitted and trued. Actually the axle was replaced, but alignment was checked. 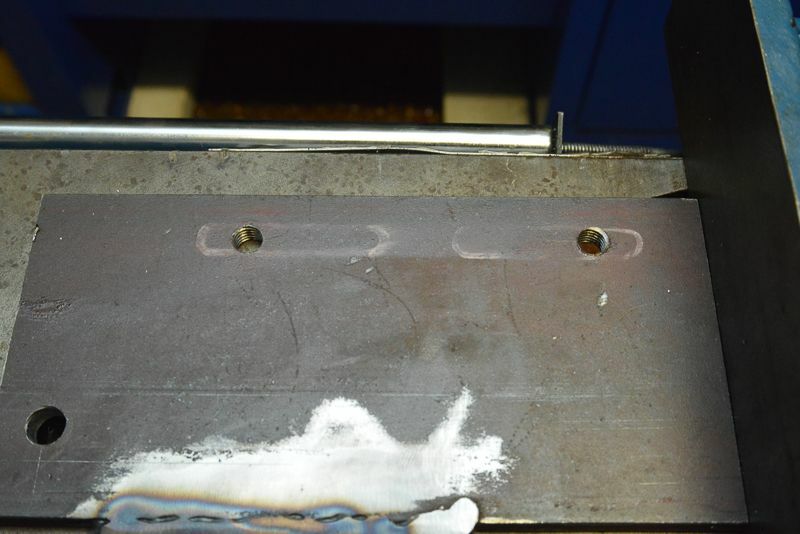 Then I checked that the blade is straight and tracks nicely try square that is on the vice. It does track. Then I had a look on wheels....well the idler wheel (non driven) looked othervise fine, but the blade was sitting few mm too deep. Very deliberatly I took biggest file I had, eyesighted the correct angle and run the bandsaw. I enlarged the chamfer slightly. The upper wheel is loose fit on axle. 1) How much play/missaligment is alowable for the upper wheel? 2) How you have been fixing the upper wheel play. Looks like boring the wheel boss and fabricating oversize steel shaft would be the answer. Thank you VT and LEW! I remembered this thread, just took a little searching to find. Since I posted above, I wore my bandsaw out! The motor went and the gear box was worn out too so it was not worth repairing. I upgraded to a Tiawanese saw which turns the whole saw assembly to do mitre cuts. It has cut dead straight from the very first day. I will say the old one did a lot of work! I used to cut down 8 metre lengths of 50mm SHS down into 55mm long pieces. I made up a stand on wheels for it. Had to make it low enough to squeeze in under my mill table. The stand it came with was quite nice too but I needed it to be in wheels. This is a class above the 4x6" and weighs twice as much.